Forget the coffee. 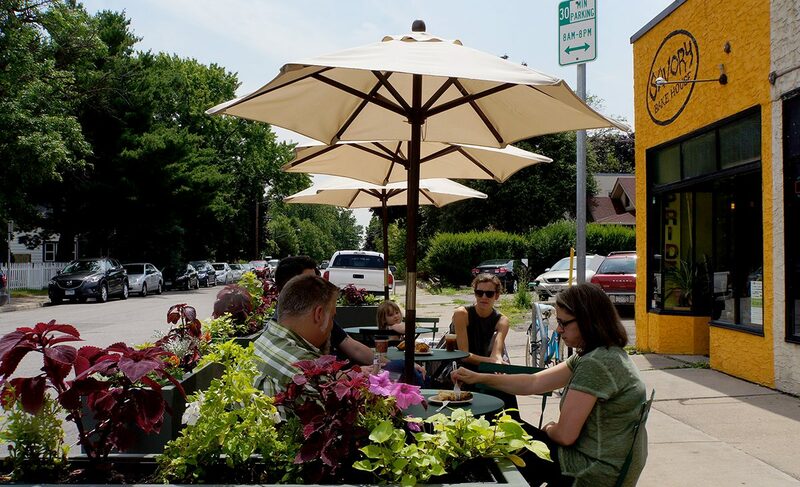 292 staff have been taking 15-minute pastry breaks on 36th Avenue in Minneapolis. Literally. 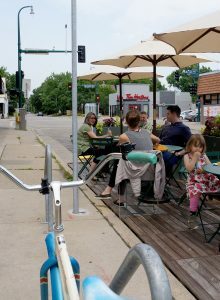 The City of Minneapolis installed a parklet just around the corner from our office, conveniently located in front of our local bakery, Savory Baked Goods. The parklet, which fits within two parking spaces on the street, consists of a wooden deck that is level with the adjacent sidewalk, patio seating with umbrellas, and planters stuffed with blooming flowers. Safety bollards and traffic curbs surround it. Parklets, open to the public, are part of a relatively new program intended to make the city more livable, walkable and beautiful. And it works. What is normally a space filled with cars and concrete – and space that no one wants to spend much time in – is now filled with color and people and festivity. It’s been a great addition to our neighborhood, and a handy employee breakroom.